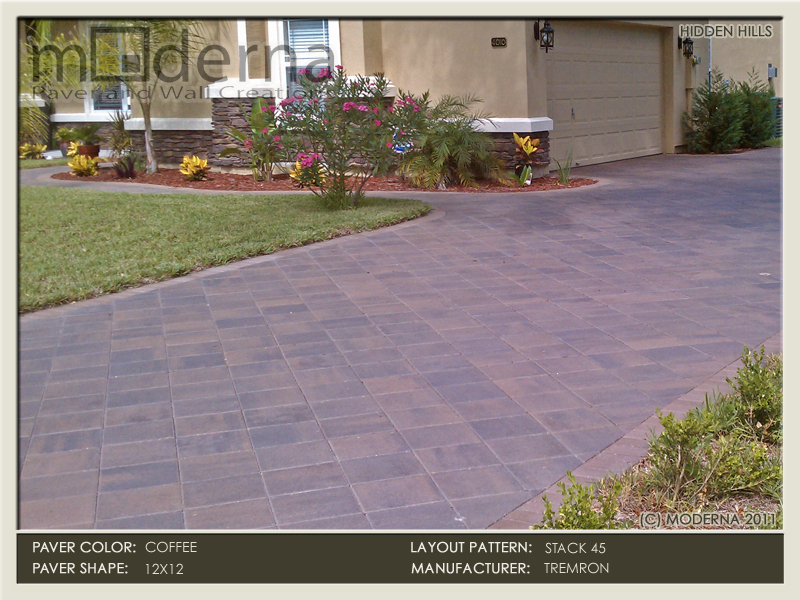 Sierra is featured on this driveway in Tremron's 3 piece Olde Towne cobble paver. There are 3 pieces together inside the pattern in alternating sizes on 6" x 4", 6" x 6" and 6" x 9". The border was constructed of all 6" x 9" pavers in the same Sierra color. Sierra has subtle blends of Sandstone, Tan, and Charcoal. The Coffee color is a blend of Brown and Tan. Solid Tan was used for the border pavers. The pattern is 12" x 12" pavers set on a 45 degree angle to the house. This project features the Mega Olde Towne pavers in the Sand Dune color. Mega Olde Towne has similar look to the classic Olde Towne but in a larger footprint. The sizes in Mega Olde Towne are 6"x9", 9"x12", and 9"x9". 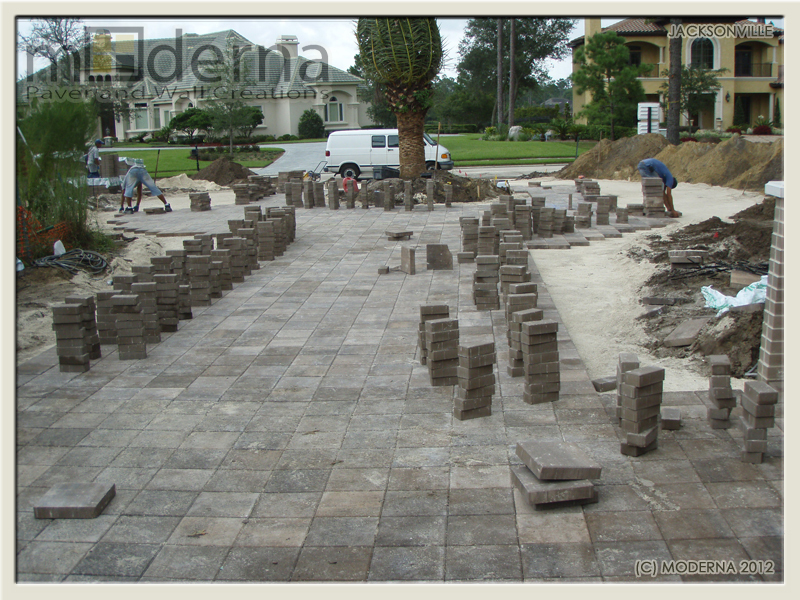 4x8 pavers are still a popular choice for paving stone driveways in Jacksonville. This weeks project is a beautiful brick paver driveway in the classic layout. The shape of the pavers is 4"x8" and they are layed out in a herringbone pattern that is 45 degrees to the home. The color is Timberbood, which is a subtle blend of Tan and Coral. The Timberwood color is one of several Tremron color blends that uses just 2 complementary colors in the blend for a less busy look. From the driveway, the walkway gracefully curves and opens up into the front porch. This project featured a driveway, walkway and entryway renovation. Its hard to imagine that before we began the project this home had a standard straight 3' wide walkway leading to the door with a sharp 90 degree corner. What a huge difference the pavers made adding some flowing curves to the walkway that leads you to a larger elevated entryway. The entire look of the home has changed and feels much more welcoming.